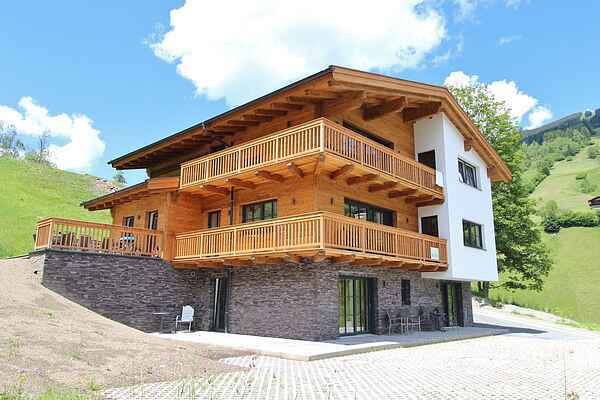 This luxurious and very large chalet was constructed in 2015 and is located right next to the ski slope and the Jausernlift in well-known Saalbach. The perfect location for winter, since it's nearly impossible to get any closer to the slope! This three-storey Chalet offers every comfort and convenience you could ask for on holiday. On the first floor (also the ground floor since the chalet is built on a small incline) you will find the lavish living room with a modern open-plan kitchen and sitting area. The living room has plenty of space for your whole group to eat together. From the living room you have direct access to the sunny balcony, or to the beautiful terrace via the kitchen. The view is fantastic, as might be expected. There are no fewer than 9 bedrooms and 6 bathrooms at your disposal. All the bedrooms are furnished in a warm and luxurious design. As an extra amenity, you have a private sauna to really unwind after an active day of skiing or hiking. Saalbach-Hinterglemm needs no further introduction as a ski destination. Nearly nowhere else will you find as many kilometres of slopes in one place, from the beginning of December to the middle of April. Nordic skiing, sleighing or even the famous après ski.in Saalbach-Hinterglemm you're in the right place. There is no shortage of sport and hiking options in summer and most of the sights and attractions in the state of Salzburg are within quick reach.